The Kintamani is a companion dog that is immensely popular in its homeland of Bali. As a secondary role it also acts as a house and property guard. Named for the Balinese town of Kintamani, this breed originated in a remote mountain district around the Gunung Volcano. 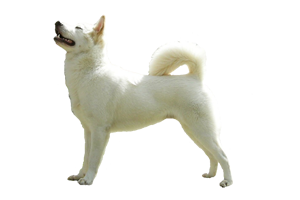 Legend states that the Kintamani is a descendant of the Chow Chow, brought from a Chinese man moving to Bali in the 1400s. The dog interbred with the local animals which are believed to be closely related to the Dingo of Australia. There may be some truth to the tale as the Kintamani is one of the few breeds that can share the blue/black tongue with the Chow Chow and another Chinese breed, the Shar-Pei. Is the Kintamani Right for You?